Solovetsky Transfiguration Monastery, southwest view across Bay of Felicity. Dusk at midnight, June 29, 1999. The striking setting of the famous pilgrimage site in the White Sea has changed little in the past 100 years. At the beginning of the 20th century, the Russian chemist and photographer Sergei Prokudin-Gorsky invented a complex process for vivid, detailed color photography (see box text below). Inspired to use this new method to record the diversity of the Russian Empire, he photographed numerous historic sites during the decade before the abdication of Tsar Nicholas II in 1917. Among the most remote places photographed was the Solovetsky Transfiguration Monastery, located on Great Solovetsky Island, part of an archipelago in the southwestern part of the White Sea. Prokudin-Gorsky’s visit occurred in the summer of 1916 as the Great War raged in Europe. His special passage to the island during such difficult times was due to his role in a state commission to photograph construction of a railroad to the new port of Murman, under construction for supplies from the Western allies. Prokudin-Gorsky made his way by rail to the White Sea port of Kem and from there traveled nearly 30 miles by boat to Solovetsky Island. The Prokudin-Gorsky Collection contains 20 photographs that he made at or near the monastery. All but three of the original glass negatives with the three-color separations have been preserved, yet the best shot of the main ensemble with the great Transfiguration Cathedral exists only in a black and white image from his album of contact prints. My visits occurred in the summers of 1998 and 1999, an ideal time, as most of the exterior scaffolding had been removed following the completion of major restoration projects. In the vast territory of the Russian north, no place carries more historical weight than the place commonly known as Solovki. The archipelago's first known Russian settlement dates from 1429, when the monk Zosima joined forces with Herman, an illiterate hermit who had visited Solovetsky Island. Although the elderly Zosima died in 1435, the following year another monk, Savvaty, came to the island and founded a monastery dedicated to the Transfiguration of the Savior. Initially the monastery belonged to the Russian city-state of Novgorod, but after Novgorod’s subjugation to Moscow in 1478, the Muscovite grand princes gained this strategic outpost. The flourishing of the monastery occurred in the mid-16th century under the direction of Philip (Feodor Kolychev), a Moscovite monk of noble origins who left his privileged existence in 1537, joined the Solovetsky monastic community, and in 1547 became its spiritual leader (hegumen). During the next 18 years, Philip guided a program of construction that transformed the monastery and created monumental buildings of stone and brick such as the Cathedral of the Transfiguration of the Savior (1558-1566), one of the most impressive examples of medieval Russian architecture. In the summer of 1566 Philip was called back to Moscow by Ivan the Terrible, who supported the monk’s appointment as metropolitan (head) of the Russian Orthodox Church. Tragically, his public resistance to acts of political terror by Ivan IV during the late 1560s led to the prelate’s exile and death in 1569. Intensive development at the Solovetsky Monastery continued throughout the late 16th-century with the construction of additional churches and other monastic buildings. Equally impressive were the monastery’s massive walls and round towers, built between 1582-1594 by monks and hired labor who manhandled thousands of granite boulders into place on the marshy ground. 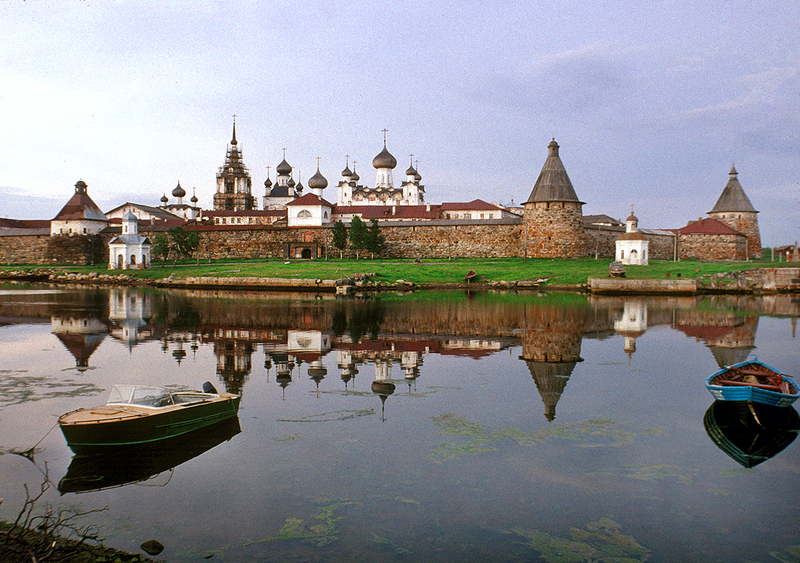 Despite political and religious turbulence during the 17th century (including a seven-year siege of the monastery in 1668-76), the Solovetsky Monastery remained one of Muscovy’s most prestigious religious centers, with close connections to the Muscovite court. The monastery received many donations, churches were repaired and other buildings were added in the 18th century. During the 19th century, it became a major pilgrimage site, with new chapels as well as its own steamship and hotel. Prokudin-Gorsky’s photographs of the monastery in 1916 were among the last views of the remarkable ensemble before the cataclysm of revolution and civil war. Even though it has survived only in a black-and-white contact print, his west view of the main ensemble across the harbor is a priceless record. In the foreground are two 19th-century chapels dedicated to St. Alexander Nevsky (left) and Sts. Peter and Paul (both rebuilt in 1855). Beyond is the west wall and the Holy Gate, surmounted by the Church of the Annunciation (1596-1601). In the background are from left: Refectory Church of the Dormition (1552-57), bell tower (1776-77), Church of St. Nicholas (rebuilt 1831-33), Trinity Cathedral (1859, behind the Annunciation Church), and the Transfiguration Cathedral. My photographs show much the same perspective, together with close views of the Transfiguration Cathedral. Prokudin-Gorsky’s photograph shows the cathedral’s slanted roofline as modified in the 18th century, while my photographs show the restoration of its original complex roofline along the semicircular gables. In 1920, the Bolsheviks expropriated the monastery and in 1923, a fire of mysterious origins spread throughout the central stone churches and reduced their interiors to charred ruins. That same year, the Soviet regime established a prototypical forced labor camp at the monastery and the territory became one of the most feared prisons in the Soviet Gulag system. Superseded by larger camps, the Solovetsky camp closed in 1939, and the territory became a military base. Thousands of prisoners had died there. Modest attempts to restore the Transfiguration Monastery began in the 1960s. In 1990, the monastery resumed its original function, and in 1992 Patriarch Alexii II re-consecrated the relics of the monastery’s founders with solemn ceremony. That same year, the Solovetsky Islands were designated a UNESCO World Heritage Site.